Where did the time go? I wanted to get one quick cherry recipe in before the season ended because I’m always scouting for ways to extend the unfairly short fresh cherry season. Plus I had some red wine leftover from another cooking project, a bulging sack of ripe cherries that the vendors were practically begging me to take off their hands (I know…it was kind of freaking me out, too), and a desire to make them last as long as I can. 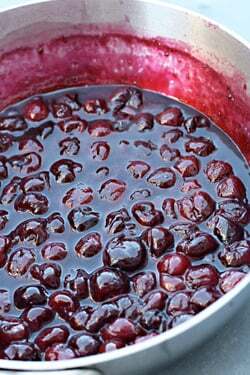 So here’s how they ended up: in a compote that’s incredibly easy to make with the spiciness of red wine, a touch of vinegar to add a little je ne sais quoi, and a few minutes of stovetop cooking to transform them into sticky-sweet orbs with the concentrated flavor of summer cherries. The good thing is that at the end of the season, they are practically giving away cherries at my market and if you’ve got the time to pit ’em, then more cherries for you wait as a reward. You can use any kind of red wine. Contrary to popular thinking, I don’t think you need to use a decent wine for this; even the super cheap stuff will work. The merlot I used cost a whopping €2.30 a bottle. I’m not sure why people tell you to use top-quality wine for cooking, especially when you’re going to be reducing it to a syrup, because there’s plenty of inexpensive wines that taste just fine to me and are perfect for projects like this. Just try to find one that’s full and fruity, like pinot noir, Zinfandel, or Beaujolais. Those wines are especially good when paired with cherries and when it’s cooked down, often have a little bit of the aforementioned spiciness to them. That said, if you want to add a few spices—a stick or two of cinnamon, some ground allspice or cloves, you can certainly do so. 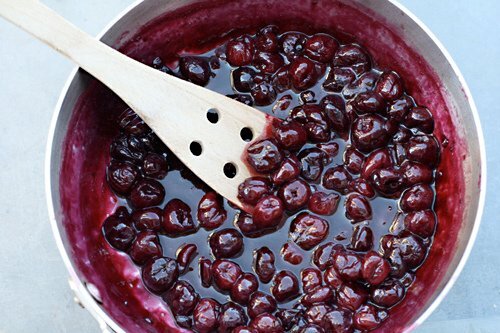 Just go easy on them; since you’re making a reduction, any spices will get concentrated and you really want the cherries to star in this compote. Being a purist, I don’t often thicken fruit sauces, preferring to let the fruit juices and pulp mingle with the sugar and let them thicken on their own. However I did add a bit of starch, which makes the sauce ever-so-slightly more substantial, but I don’t add enough so you’ll detect it in the compote. You can leave it out if you prefer. 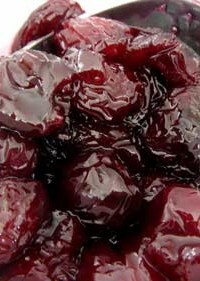 For a few other ways to preserve the cherry crop, check out No-Recipe Cherry Jam and Quick Candied Cherries. 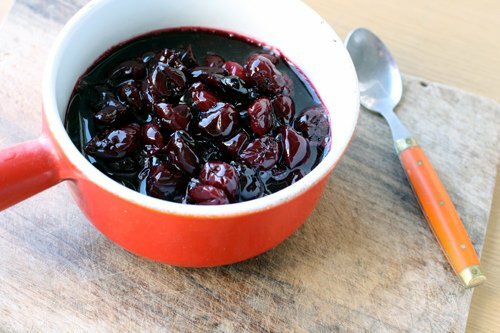 These super simple to make cherries are easily mixed into a summer fruit salad, served alongside grilled pork or chicken, as a topping for Vanilla Ice Cream, or even alongside warm Caramelized White Chocolate Cakes or another favorite chocolate dessert. I used bright-red sweet cherries, but feel free to mix in some of the multi-hued varieties, such as Queen Anne (incongruously called ‘Napoléon’ cherries in France) and Ranier. If you can get sour cherries, a mix of those with the sweet ones is cherry paradise. 1. 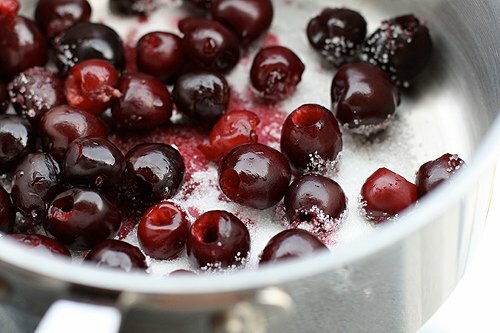 Put the cherries and sugar in a large, wide saucepan. 2. 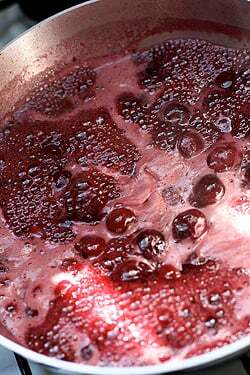 Mix one tablespoon of the red wine with the corn or potato starch in a small bowl until it’s dissolved and set aside. 3. Add the rest of the wine and the vinegar to the saucepan. Bring the heat up to a boil, then reduce the heat so it’s at a low boil and cook, stirring frequently, for about 12 minutes, until the cherries are completely wilted and softened through. 4. During the last moments of cooking, stir in the starch slurry and let the mixture boil the additional minute or so, to thicken the juices. 5. Turn off the heat and stir in the almond extract and kirsch, if using. Storage: The cherries will keep up to one week in the refrigerator. They can be frozen for up to six months. Wow. If it weren’t winter here I would be rushing out to buy some cherries right now. Instead, I’ll have to settle for some winter rhubarb (don’t know why but I can always find it in winter, never in summer) to serve with those caramelized white chocolate cakes. I wonder if tying the pits in muslin and dropping them in for a very short period of time might help to thicken it without becoming too jammy. Perhaps even a touch of agar? I don’t enjoy the texture of starch-thickened sauces but hate watery ones. Hi Vidya: I’m also not a fan of starchy sauces and this amount seemed to be just right and it was not perceptible to me. One could swap out some apple juice (which is pectin-rich) for some of the red wine, although I like the bold, concentrated wine flavor with the cherries. David, this recipe sounds amazing! Cherries are my favorite! My boyfriend and I are currently visiting Paris, and upon your recommendation, ventured to the 10th two nights ago from our apartment in Montmartre for pizza (!) at Maria Louisa. We took the metro, and then got lost trying to find the restaurant, and arrived only to have them say they’d JUST stopped serving (10 PM!). I speak a reasonable amount of French, but was unable to convey my sadness at having traveled all that way only to miss out on their gorgeous food. We couldn’t believe a restaurant in Paris would stop serving that early…. Anyway, the point of this story is- do you think it’s worth it to head out there again tonight (our last night in Paris), or is there somewhere else- reasonably priced- that you’d recommend? Odd they stop so early (since they don’t open until 8pm! ), but you should call for a reservation to ensure a table, like most places in Paris require on a busy weekend night. I actually prefer the pizza at La Briciola, which has the same owners, although there’s no outside seating. I’ve tried several times to enjoy red wine as a drink but I’m a real white wine girl… however, I do love the richness of red, so this recipe is a keeper! I’m particularly in love with the balsamic vinegar addition idea…. yumness. Sometimes I poach rhubarb in red wine with sugar, cinnamon and cloves. It’s yummy. I recently tried it with white wine but I prefer red. Now I’m going to have to try cherries in red wine, since like you said, the flavors of cherries and red wine are harmonious… Thanks David! I have a feeling that I would like to eat this simply with a spoon. I’ve got a few pounds of pitted cherries in my freezer, and this sounds like a great way to make the most of them Also, I made your chicken and mango slaw a few nights ago, and it was absolutely wonderful! Thanks for all the lovely ideas. I wish I was able to visit that market, cherries here (= Antwerp) are super expensive… My parents have a tree (sour) but that’s done by now (finished off by the sparrows), so I’ll bookmark this for next year. Why must cherries be such a task to pit and one of the most delightful summer treats all at the same time?! Adding in the wine just makes it all the more tempting. So now we just must make this and serve it with massive bowls of ice cream like you suggest…ah summertime! David, your instructions fail to indicate what to do with the bowl of cornstarch slurry; you never wrote when or how to add it to the pot. I wish they were practically giving them away over here. Alas, the season is over, and we are already on to apricots and peaches. It’s been a very early season, and for some fruits, quick! 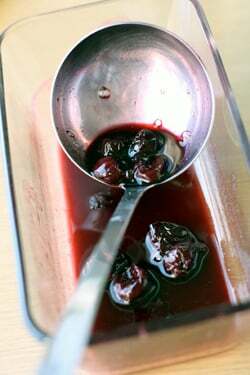 I love cherries, and this recipe looks fabulous. Thank you. I have two bags of them secreted in the freezer, and this is bookmarked! I’m so glad to see some savory-sweet recipes using sweet cherries. That’s mostly the only cherry we find in the SF Bay area. I’ve been making a point of inquiring at the u-pick farms (the few that are left!) about sour cherries just to let them know there is interest out there for that type too. I finally found a source for the sours, but they are imported in from Oregon or Wisconcin, I think that’s what I was told, at the end of July, so eating local is not an option for that variety. This recipe will help me find more uses for the sweets in the mean time. I would love to have this on the winter holiday table too, so I”ll freeze some sweets to use just for that purpose as well. Thanks, David. David, have you ever tried putting a bag of cherries in the freezer? It changes the texture a little but you can keep em for longer and they’re strangely addictive. I wish they were giving away cherries here in L.A. For all that I love the gloomy weather we’ve been having for months, it has resulted in mediocre-at-best cherries that are at least $4 a pound at the farmers market. I’ve found them cheaper other places, but I’m not buying them if I can taste them first. Last weekend they were marginally better, so I’m hoping that the season is just extraordinarily late and I’ll find some decent ones tomorrow. All I want is to make one silly clafoutis this summer – is that asking too much? By the way, how does this reicpe freeze? Does it get solid, or does it stay kind of slushy due to the sugar content? Poetry! You really do find the right words each time. I’m wondering what sort of implement you use to stone your cherries. Carrefour (and no doubt lots of other outlets) sell a Leifheit box thing which takes the trouble out of stoning. Only 25 euros. Sorry if you give this info elsewhere. It’s going to take me months to discover all the wonders on your blog. Thank you for them. Chrissy: I do use a Kernex cherry pitter, but am planning on picking up one of the Oxo cherry pitters on my next trip to the states since I’ve heard they’re pretty great. I’ve used those box pitters before which work really well, but I don’t currently own one. Aria: Yes, I do put pitted cherries in the freezer to use at other times during the year. 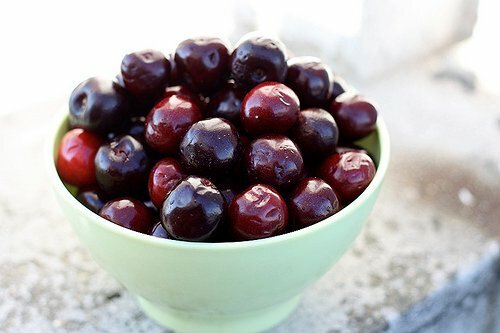 But I’m doing my annual freezer clean-out (in preparation for an upcoming gelato event) so am making compotes and such with my cherries. Very nice use of cherries – looks great! And there are so many ways to use it. I’ll second the recommendation for the OXO cherry pitter (it does olives too!). I bought it last year and loved it so much that I posted about it (http://whatsonmyplate.net/2009/07/12/what-i-bought-cherryolive-pitter/). 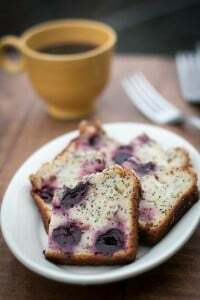 We’ve been making something very similar to this for years, albeit it with berries as well, and it makes a great low-fat, non-dairy dessert ladled over Angel Food cake. Also, a great way to pit cherries is to use a paper clip. It worked like a charm on my sour cherries this year, and it doesn’t blow a hole out the bottom like the standard pitter does. Here’s how to do it. 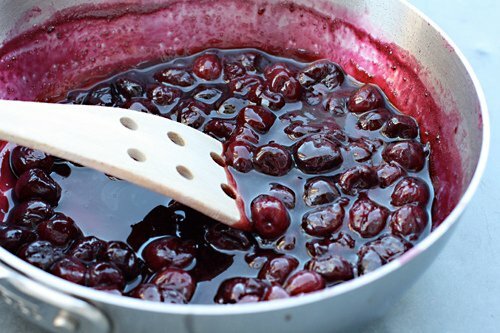 I so love cooking with cherries in the summer! Here in SoCal they’re finally getting cheap – as in $2 a pound instead of $5! I love making a chutney with cherries onion, wine and spices that I pull out around Christmas to serve with the ham! So tasty! Love the looks of this recipe…can’t wait to try it now in the summer and save the chutney for later! Thanks for sharing! Looks great. Can’t wait to try it! David, in the past using corn starch in a fruit sauce or compote that was chilled turned it cloudy for me so I use arrowroot instead. Does the red wine or darkness of the fruit mitigate that in your recipe? What’s your experience with cornstarch vs arrowroot with fruit sauces/compotes/etc? Am looking forward to trying this with the best cherries I’ve ever had, from Montana, an annual treat that will be mailed in early August. Thanks! That’s one of the reasons I often avoid thickening sauces (some folks use tapioca, which can be a bit gluey). But as you can see from the photos, I hope, the sauce wasn’t cloudy at all. I buy my corn starch at the Arab market, but would be surprised if there was a discernible different between various brands in their efficacy for making a compote such as this. If you have doubts, simply omit it. David, this recipe comes at the most ideal time! I was searching for new sauces to use with the abundance of cherries I have! Thank you! Well, I for one am glad that you are posting cherry recipes, because here in British Columbia, the cherries are just arriving. As a matter of fact my favourite cherries which are from an organic farm in the Okanagan Valley have not even made it to the market yet. The area where the farmer grows them is higher so they arrive about two weeks later than other cherries, but they are so incredibly delicious that the wait is worth every minute of it. But I do have some cherries from another grower, so maybe I need to get them out and make this compote. And here’s my handy cherry pitting hint – if I’m going to use the cherries and having them whole is not important, I slice them in half, twist off one side and pick out the pit with a pair of clean tweezers. It’s a lot easier on the hands than the cherry pitter I once bought. Sure it might take a little longer but every now and again you just pop a cherry in your mouth and enjoy its sweet juiciness and that makes it all worthwhile. pitted the remaining 3 quarts of Michigan cherries with my Leifheit pitter (the best $25 I ever spent on a kitchen gadget). I froze the cherries on a cookie sheet and packed them into zip lock bags to make preserves in the future. As tomorrow is farmer’s market day I will doubtless buy more–but this time I will buy some sweet Bings as well and mix them together in this recipe. We love to drink cherry syrup in ice cold Evian. My sister only makes fruit syrups these days as no one really eats toast any more. You probably know already that in Greece, visitors are given a glass of cold water and a spoon of sour cherry preserves (gyko) to mix in. Very refreshing! In a pinch, bobby pins make great cherry pitting tools. Oh, the cherries! Nova Scotia’s produce appears to lag about 2 weeks behind other regions and this recipe doesn’t whet my appetite at all (or make me a smidge jealous)! I’ve recently started drinking Syrah because I like the depth and the extra bit of spiciness and I think I’d be inclined to use it for this recipe. About cooking with a “decent red wine”: My understanding has been that the point of that instruction is to cook with a wine that you think is good enough to drink. This guidance emerged years ago (Julia Child time, Galloping Gourmet days? ), before Americans got so into cooking, and wine was perceived as mysterious and expensive. You may recall that there was also this crap called “cooking wine” in American supermarkets, which had salt in it (so that it could be sold in supermarkets, even in American states where wine could not be sold in supermarkets). The point of the “decent wine” advice was to steer you away from awful stuff like this. It always made perfect sense to me- if it is not good enough for your glass, why would it be good enough for the pot? It may only be the Jersey shore but I am making the cherries and dreaming of Paris. I have lots of cheaper red wine and this sounds like a great way to use it. Our cherry season is just beginning. Steve: Yes, there is something called ‘cooking wine’ which is somehow modified so they can sell it in supermarkets. In the restaurant food catalogs, they also sell special liquors that are undrinkable, on purpose, so that the staff doesn’t consume them (!). Sophia: I love sour cherries and whenever I see them, I buy as many as I can. Those box cherry pitters are a worthwhile investment if you have to pit a lot of cherries. My apartment is pretty tight, so space is super valuable, but whenever I am standing there with my individual pitter, with a big pile of cherries, I do wish I had one. I bought some griottines (sour cherries) the other day driving up from Avignon off of A7. Can they be used in this recipe? I may have to increase the amount of sugar. Just saw your interview on France 24! It was great! Congrats! Okay, thanks to you I have ordered my first cherry pitter. My banker thanks you. Wow, this sounds amazing. I just bought my first cherry pitter yesterday to tackle my farmers market purchase. Now I know what I’m doing with the rest of my cherries. I’ve added a link back to this post on my weekly secret ingredient. If you don’t like that just let me know and I can take it down. I just thought people should have the link! The recipe looks and sounds wonderful! In Ithaca NY in our shared house a few summers ago, we would all sit at a picnic table and pit baskets of cherries, using paper clips. Of course, in France I ‘ve noticed the clips are a different shape–less rounded and more pointed. Meg: I am heading back later in the summer and would’ve picked you up one. But it would’ve cost probably €65 to send it to you from here. Happy pitting! David, Beautiful photos! It’s been hard to keep up with the fruit this season in New England since we had so much hot weather early, but now I am motivated to get on the cherry detail before it’s too late. I love the red wine in this–I often make cherry compote with a little amaretto to take it in a different direction and then mix it with plain yogurt in my ice cream freezer, so am looking forward to yet another variation. I’ve tried making frozen yogurt with plain (uncooked) cherries and it just doesn’t work at all–they taste grassy and strange, so it’s intriguing how even a few minutes of cooking makes such a huge difference. Thanks for the inspiration; I’m gonna head to the farm stand and pull out my cherry pitter today! I have been so busy with other projects that I have pretty much missed out on cherry season here. We just picked up some Ranier cherries today at the farmers market, but I want to eat those one by one! I agree with you and generally prefer not to add thickener to my fruit sauces. They usually will do fine on their own. I made these today – absolutely delicious! Thank you for the recipe. Looking forward to trying more of your dishes. 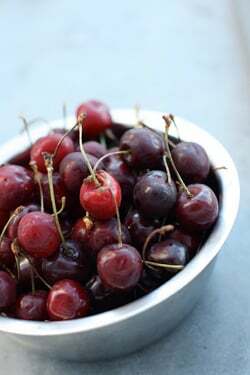 Just made the recipe with 2 lbs of fresh local Columbia Gorge Bing Cherries (Portland, Oregon here). Great tastes, perfect texture with the cornstarch. I used both the almond extract and the kirsch (Clear Creek). Extract adds depth with no almond flavor and the kirsch adds a crisp “stoney” flavor, somewhat suppressing the sweetness. When I make it again, I’ll reduce the sugar by about a third and reduce the balsamic vinegar by half; it’s a little too balsamiccy for my tastes. It will be served over homemade vanilla ice cream (made with yolks from the chickens out back!) tonight after a dinner party. Merci, David et Bon Appetit! I made this to serve with the chocolate idiot cake. I make something similar, using maple syrup and honey instead of sugar, cider vinegar, and no starch. I serve it warm under a medallion of foie gras that has been pan seared with Sichuan peppercorn, white and green pepper, salt and brown sugar, or with duck magret. Dried cherries work well too. Perfect timing! I just bought the last 5 pints of sour cherries of the season. Must use recipe with vegan French Vanilla ice cream. YUM! Dear David…I appear to have a very sweet tooth for it is this blog I find myself turning to more and more often! This post reminds me of the time I went cherry picking with my grandparents in Pennsylvania and just as we were packing all our buckets of cherries into my grandpa’s Oldsmobile, a bear ran out of the woods and tried to take a bucket of cherries out of my grandma’s hands. Well, my grandma wasn’t going to lose those hard-won cherries just because some bear wanted them, so she pulled a baseball bat out from under that old apron she always wore and just slapped that bear into left field. Man, I miss her. I made your Almond cake and added these cherries on top of the cake..another great hit from you to our table~ Thanks David! I made this wonderful sauce on the weekend, and we ate it with vanilla ice cream on a very hot day. What a winner! I used a fruity Cabernet Sauvignon from Chile and added some aged balsamic vinegar. The corn starch worked just fine, without becoming cloudy. I have frozen the rest to use over ris a l’amande at Christmas – if I can wait that long. Just made this last night and it was so beautiful to make with its incredible color. All the stores were out of cherry pitters and so I used the paperclip method. This was soooo simple and easy to do. My wife’s old plunger type pitter was only successful on every other cherry and the a paper clip worked everytime without putting a hole in the bottom. What a great trick. The cooking time took a lot longer for me to get the cherries wilted and soft. I was using big “Bing” like cherries from the Pacific Northwest – perhaps they are bigger than what David used. My effort needed 24 minutes of boiling to reach a nice softened consistency. I used the corn starch and no problems with cloudiness. Thickened beautifully. The taste definitely has a very pronounced wine flavor mixed with cherry so this is not strictly a cherry only compote. I enjoyed some while still warm over yogurt last nice and it was very good, but can’t wait to try over vanilla ice cream or a panna cotta I plan to make. It is also VERY sweet and so I wonder if the poster’s idea above about cutting back the sugar a bit would be a good idea. Thanks for the inspiration and getting me to try something new. I have been working my way through your Perect Scoop ice cream book and everything is coming out PERFECTLY. Thanks for all. I’m making this tonight! Question – where do the “two tablespoons of red wine or 1 tablespoon balsamic vinegar” come in? or did I miss it in the recipe? I’m assuming you’d make the slurry with this. Well, that’s what I’m going to try, anyway. I was in Paris last week and had the most incredible cherry clafoutis from a prepared food store on Rue Cler. It was almost all (sour) cherry and very little clafoutis with a golden top. 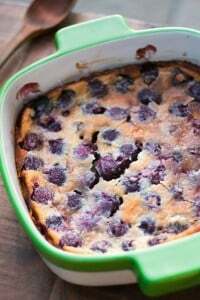 Do you have a recommendation for clafoutis recipes? bc: There’s a recipe for clafoutis in my book, The Sweet Life in Paris. Michael: It goes in with the wine, in step #3, although you could use it to make the slurry as well. bellagatta: This is the perfect accompaniment to that cake…glad you liked them! Fantastic! We’re just coming into cherry season here. So I’ve made preserves, jam, and pie filling. Here’s another way to extend the joy. I may add Tonka Bean, my new obsession, to them. Especially liked the idea that these cherries will freeze well for up to six months, thus happily extending the otherwise short cherry season! I’m a fairly recent convert to poached pears in red vine and now you tempt me with cherries! Lovely. Wine mixed in with cherries. I can see that making an excellent side dish to a perfect candle lit dinner. I will have to try this fruit recipe soon. We had a bumper crop of gorgeous tart cherries last summer here in New Jersey and I happen to have several bags of pitted cherries in the freezer just waiting to be used. Do you think this recipe would work with frozen cherries? My thought was to serve the compote warm over panna cotta.